Sometimes watches are tricky to identify because they had different dials at different times. 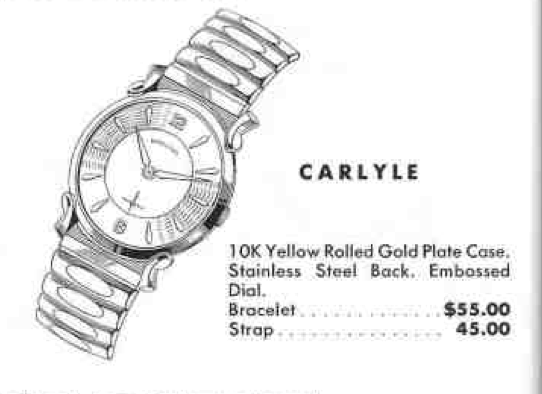 A good example is the 1958 Carlyle, not to be confused with the 1930's Carlisle. The Carlyle was produced through 1961. It started out with an embossed numeral and marker dial and wound up with an embossed all-numeral dial. In between both dials were available. Normally Hamilton's catalog drawings were very good approximations of the actual items. It's interesting to note that the 1958 catalog shows a textured ring where the markers are but the later years do not. It sort of begs the question, are there really three dials? The case is 10K yellow RGP with a stainless steel back. 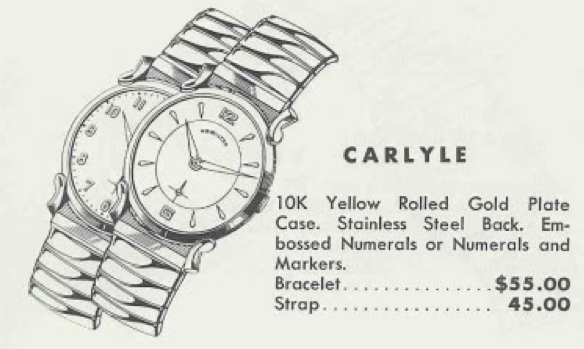 The horned lugs are reminiscent of other models and can make identification of the Carlyle tricky because there is a "I've seen this watch before" aspect to it. Inside you will find a Swiss-made Hamilton 673 movement - which was very common in the entry level, sub-second hand, Swiss-movement models available during the late 1950's and early 1960's. I recently landed a Carlyle project watch. It was one of the grungiest watches I've acquired without it being a "parts watch". I was hopeful that I could save it. The stainless back snaps on and off using a slight gap in the side opposite the crown to insert a case knife. Without the beat up crystal in the way, you can see the dial is sort of a gold-color and very dirty. The 673 movement has 17 jewels but if you look closely you might note it has a cap jewel over the escape wheel on the train bridge. That's normally the situation with 19 jewel movements. But for this movement the center wheel does not have a jewel on the main plate, making up for the difference in jewel count. Oops! Well my dial cleaning was going really well until the T in Hamilton lifted off and floated away. Then I lost a few other letters and part of the seconds register too. It all came apart like a house of cards. When it comes to dial cleaning, the trick is to know when to stop. Otherwise it will become too clean. I may send this dial out to just be reprinted with HAMILTON and the seconds cross hair. I don't think these textured dials refinish well when the whole dial is redone. The textured part always comes back too soft. Everything else gets cleaned and dried and ready to be reassembled. A little tweaking to the regulator is all that's needed to get the movement to keep acceptable time. I usually leave them running just a little fast as they tend to settle down eventually. And here's the "almost-finished" product on it's pillow shot with a new old stock vintage strap and a fresh GS PK-style (low dome) crystal. It was too bad about losing the printing but it's not irreparable. The dial still shows it's age but it's consistent with the wear on the case overall. So I think just getting the printing restored will be all that's needed to complete the restoration. A buddy of mine pointed out the lugs on my watch aren't quite correct for a Carlyle and look more like the Coburn. Maybe it's a Coburn with the Carlyle dial? 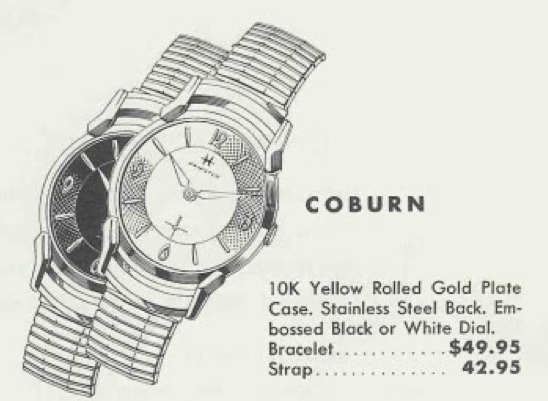 So the mystery is solved… my watch is a 1960 Coburn, not a 1958 Carlyle. I should have also known because I just realized the Carlyle doesn't have a number at 3 and 9 - just markers. Did I say sometimes identifying models is tricky? Well, I decided to get the dial redone to improve the printing. I think it turned out great, even with the textured and embossed figures. Hey Dan! Very cool. The image is missing in the "update to my update..." section, just an FYI.